Respawn’s Star Wars game, unlike Visceral’s, hasn’t been unceremoniously canned. It will take place between the events of Episode III: Revenge of the Sith and Episode IV: A New Hope (because you definitely couldn’t have guessed that from the game’s clunky title ), set during the dark times of the Jedi Purge, in the aftermath of Order 66. Anything that reminds me of that garbage Revenge of the Sith film isn't a great start. Just saying that full title out loud sounds terrible, like five completely disconnected words. Makes the name work a little better but the whole announcement was still pointless - just wait until you actually have something to show! I thought that it might be, but wasn’t sure, and I really couldn’t tell by the way that they were phrasing it during their little “announcement” Thanks though, I’ll update the thread title! Something that now worries me with the movement of the colon is that they’re trying to make this a new sub-brand, and I don’t really like it. Battlefront is a great sub-brand name in that it encapsulates everything that the brand is in one word, but this sounds almost ludicrously vague when compared to other sub-brand titles in the franchise - cool, I play as a Jedi, but what else? I can already imagine the names of the sequel - New Order, Luke’s attempt at rebuilding the Jedi Order, but through the eyes of one of his pupils whom goes on to become a Knight of Ren - and the threequel - Resurgent Order, Rey’s attempt to rebuild the Jedi as they once were, prior to the Order that found itself based on Coruscant. We assume the role of a Jedi with PTSD and flashbacks to that night on Coruscant when all of his/her youngling friends were slaughtered. He’s become a smuggler or something, and he’s given up on the Force after all that’s happened. We’ll run into Vader or the Grand Inquisitor, and this will get the ball rolling in terms of running around the galaxy. We’ll run into one too many major characters for it to feel like it isn’t a mash-up piece of fan fiction. It will be extremely linear - given the period in question, I feel it has to be - and can only realistically end in a couple of ways: death at the hands of Vader/an Inquisitor, or we end up somehow surviving all of this and we flashforward to meeting some combination of Luke, Ezra, Sabine and Ashoka in the thirty years between ROTJ and TFA. I just don’t see what they can do in this era which we haven’t already seen in other pieces of canon. It doesn’t feel new, even if it does sound like it has the potential to be exciting - but since when has controlling a Jedi not been exciting? This is EA we’re talking about — they have to fulfill their fiduciary duty of messing up a Star Wars game somehow. Saw this earlier, and my reaction is kind of nonplussed: it was expected, and I would have been really disappointed (and doubted it's potential to release at the end of the year) if we didn't get anything at Celebration. What I'm much more interested in is that there have been rumours going around that there's going to be a lot more than just Fallen Order present on the gaming side of things at Celebration -- outside of the games that will be returning (Galaxy of Heroes, Pinball, and SWTOR). I'm just realising how top-heavy this year's going to be for Star Wars fans. It's been virtually silent up until this point (and could potentially be until the first trailer for IX at Celebration in April), and then in the last three or four months of the year we get 10 episodes of The Mandalorian, a new live-action TV series; 12 episodes of The Clone Wars, a returning animated TV series; Jedi: Fallen Order; and Episode IX. Can't help but feel that, despite all of its recent success since it's return, the franchise is in a real weird place right now. Hopefully this game can begin to make things right. I'm suddenly a lot more interested in this game. Please don't ruin it EA. I've just heard this takes place shortly after Revenge of the Sith? My hype for this game has just plummetted, that's the LAST time period I'd like to play in. Gutted. Hopefully the game play and storyline will make up for it, anything will be better than that car crash of a film. Love it. Looks just like the concept art from the Making Of books for the prequels and the Art of books for the sequels. Can't wait to get more of a look on Saturday -- certainly cautious after EA's spotty-at-best track record with their handling of the Star Wars license, but optimistic that Respawn will bring something great to the table! It's a lovely looking poster. I'm still really gutted about the time period though. I have so little interest in the prequel era. Any chance this happens a few years after Revenge of the Sith though, I don't remember TIE fighters looking like that at the end of that film? Apparently it's been confirmed this is being developed in Unreal 4 and that it started before Respawn came under the EA banner. So that should be good news for those worried about any issues that running the game on Frostbite might bring. It's also sounding like a heavily single player focused title so there's that as well going for it. From those two bits of info, it's certainly taken a step up in my mind. Respawn have been on a bit of a roll and they've definitely got the talent to do this well so I'm optimistic that they've got something great to show. I'm still cautious about it because of the EA influence but I suspect that Respawn may have been allowed to simply get on with the game with very little influence from EA as they do seem to have retained some autonomy after being purchased. We'll see but I'm hoping they've managed to continue the strong single player work from Titanfall 2 here. Pretty sure they've confirmed that it will be taking place between III and IV, but yeah, it seems much closer to III than IV from what I've seen going around. That being said, I doubt it literally takes place just after III ends ("shortly after" is pretty vague), so I have to imagine that there'll have been enough time for them to transition from V-Wings (what we see at the end of RotS) to TIE Fighters. Probably get a prologue during Order 66 with the main character as a budding padawan watching his master get sliced down, though. I'm just hoping that it isn't too similar to other stories (i.e. Kanan's) that have already been told in canon. Wouldn't mind a hint or two at some ancient Jedi/Sith stuff in this game. We know that Old Republic stuff is the most likely era to carry the franchise after IX, and the tweet clearly makes use of McQuarrie's ancient script used in many pieces of his Staff Wars concept art. That lightsaber design is giving me Old Republic vibes too, actually. @Ganepark32, yep, that's what I've read too. 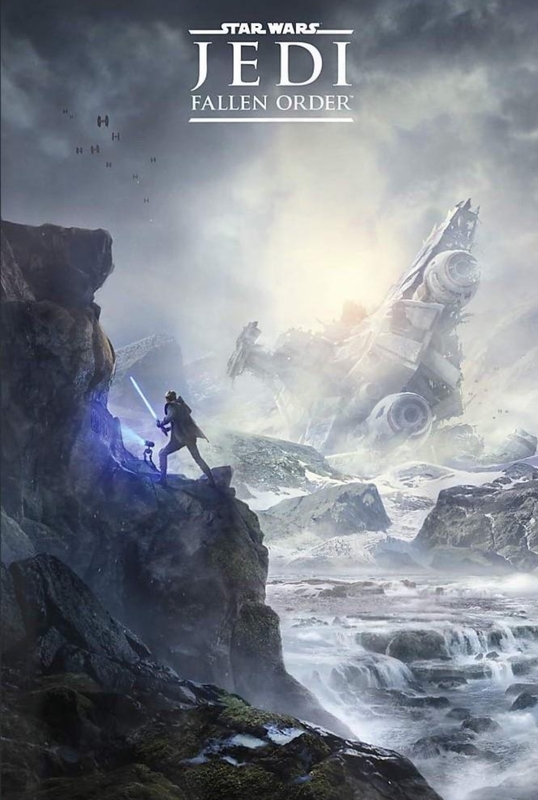 The Frostbite engine looked at its best in the Battlefront series, in my opinion (it didn't run great all of the time, but looked much better than it did in EA's sports catalogue of games), but I'm 100% behind seeing Star Wars in UE4. Strange that I've only just seen Schreier over at Kotaku report this, though. It's been out there for quite some time -- guess he was busy just corroborating sources. @Ganepark32Pretty sure they've confirmed that it will be taking place between III and IV, but yeah, it seems much closer to III than IV from what I've seen going around. That being said, I doubt it literally takes place just after III ends ("shortly after" is pretty vague), so I have to imagine that there'll have been enough time for them to transition from V-Wings (what we see at the end of RotS) to TIE Fighters. I hope so. The IV era TIE fighters in that poster give me hope. I just rewatched the scene at the very end of RotS and they definitely don't look like the ships in that Death Star construction scene. To be fair, that's simply because it's so soon after the change from Republic to Empire -- they're using repurposed and repainted Republic era ships (V-Wings) as opposed to TIEs in that scene. Same goes for the cruisers: we see Republic era Venator class cruisers which have been painted grey at the end of RotS as opposed to Star Destroyers. For the record, the downed cruiser in the poster above isn't a Star Destroyer either -- that's a Venator class cruiser. I don't think it makes a difference when it's set in the slightest, because it will have little impact on the quality of Respawn's storytelling efforts. The Clone Wars is mostly great and is set during the prequel era. I'd actually much rather it be set closer to III this time around so that there's room for potential sequels or other projects to exist in the same space, but that being said, I am starting to get a bit tired of everything being shoved in between III and IV since Disney's take over: sequel trilogy aside, we have four seasons of Rebels; Solo; Rogue One; and far too many comics and novels set in the 19 years or so between those films. It feels like they're needlessly narrowing their scope: there are great stories to tell throughout the timeline, so I hope that after IX we start seeing more of a concerted effort to fill in the gaps in other periods. I don't think it makes a difference when it's set in the slightest, because it will have little impact on the quality of Respawn's storytelling efforts. On the whole I'm sure it won't. I'm just talking my own tastes here, I'd personally much rather see an original trilogy or sequel era game. I'll gladly trust Respawn to tell a great story regardless though. For the record, the downed cruiser in the poster above isn't a Star Destroyer either -- that's a Venator class cruiser. Yeah and the fact that it looks old, like it's been there a while could point to it being a few years after RotS. The guy makes me feel like I'm watching an episode of Rebels for some reason. Dunno what it is. Seemed fun enough, disappointed no gameplay footage. For some reason I assumed we'd see some. Not openworld apparently but there'll be large areas to explore. Hoping for something like God of War.